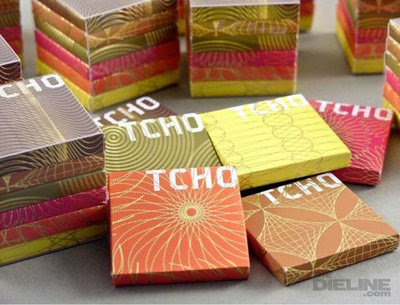 A bunch of chocolate loving tech geeks from San Fran got together to create TCHO, their very own luxury chocolate operation. The name is a hybrid of technology + chocolate. Their approach to chocolate sourcing, packaging, production and tasting is totally geeky--providing us with long, technical reports on sourcing, formulations and tasting techniques. They even created their own flavor wheel which organizes the flavors inherently found in chocolate. I'm especially fond of the packaging which is based on algorithmic guilloche patterns. I'm trying to get my hands on a few of their bars asap. I'm certain they'll make me smarter. Via The DIELINE.